The annual Gee Cross Fete - fantastic family fun! The best of traditional family entertainment with a circus theme. There'll be plenty of entertainment, sideshows, dancing, singing and much more. Starting at 11am with the Annual Praise Service there will be clowns, sideshows, craft stalls, refreshments, rides and dance troupes. And new for this year - the Scruffs Dog Show. 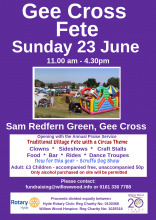 As always, the Gee Cross Fete is organised jointly by Willow Wood Hospice and the Rotary Club of Hyde, with all proceeds divided equally. Adult entry is £3, with accompanied children free, unaccompanied 50p.